Born in Oberndorf (suburb of Kitzbühel), Austria, on February 8; son of Maria (née Ritzer) and Franz Walde. 1903-1910 Attends the Imperial-Royal Secondary Modern School in Innsbruck. First aquarel and tempera works. Studies at the Technical University of Vienna (Architecture). Visits Kirchdorf, Upper-Austria; lives in Weidlingsau (suburb of Vienna). Contact with Egon Schiele and Gustav Klimt. Receives support from the architect, Robert Oerley. First exhibtion in Innsbruck (Czichna Gallery). First exhibition at the Wiener Secession. 1914-1918 One year of volunteer service in the Imperial-Royal Landesschützenregiment 2, followed by service in the Landesschützenregiment 3, in Innichen, including tours of duty near Monte Piano, Zugna Torta and Pasubio. 1917 Returns home as a Kaiserschützenleutnant (Imperial Lieutenant). 1918 Returns to the Technical University of Vienna for the summer semester of 1917-1918. Contact with Egger-Lienz with regards to founding of a chamber of artists. 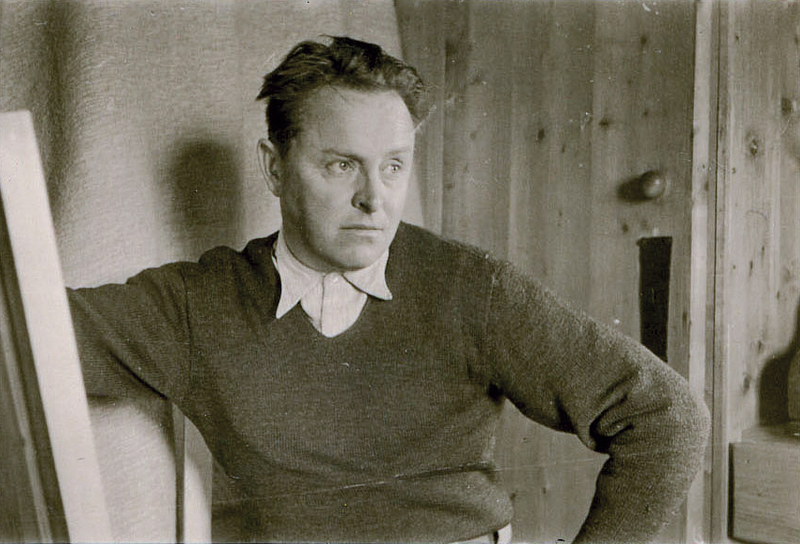 1919 Friendship with the “workers’ poet,” Alfons Petzold, who had recently moved to Kitzbühel. 1920 First exhibition after the end of the war in the Wiener Secession. 1924 Takes first and second prize in a competition of the Tyrolian Traffic Office (theme: winter landscapes). Designs and helps complete (along with fellow artist Andreas Einberger) two Kaiserschützen (imperial soldiers) for the Tummelplatz in Innsbruck-Amras. Marries Hilda Lackner, from Kitzbühel. Particpates in the Biennale Romana art exhibition in Rom; grant recipient of the Julius Reich artist foundation. 1925/26 Participation at the moving exhibition Tiroler Künstler (Tyrolian Artists) in Rheinland-Westphalia. 1926 Completes his first poster designs. 1927 Chief planner in project planning and development for the cable car stations in Kitzbühel/Hahnenkamm. 1928 First prize (shared with Painter Rudolf Stolz, from Bolzano, Italy) in a renewed competition to perform commissioned work for the train station in Innsbruck. Builds his own house on the Hahnenkamm/Kitzbühel. Marries Lilly Walter, from Hall, Tyrol. His daughter, Guta-Eva, is born. 1932 First offical poster release for a Tyrol-commissioned advertisemt. 1935 Draws plans for the Hotel auf dem Brennerhof, in Kitzbühel. 1940 Marries Ida Tropschuh; recruits as a pioneer to Salzburg, after a few weeks released because of illness. 1946 Two months of imprisonment in Innsbruck, as the result of intrigues against him. Begins intensive preoccupation with architectural projects. 1956 Awarded the title of Professor. 1958 Died on December 11 from heart failure, while staying at his sister’s house in Kitzbühel.